You are currently browsing the category archive for the ‘classics’ category. Whenever I think about escapist fiction, fantasy is always the first genre to come to mind, but lately I’ve come to realize that my ultimate comfort reads might be Persephone-style books: mid-20th century stories about women, where at first glance nothing much seems to happen. Mildred Lathbury is a 30-something single woman living in London in the 1950s. Between church affairs and a part-time job at a genteel women’s support association she leads a quiet and contented life. The novel starts when the flat below Mildred’s is rented by an exotic couple, so Excellent Women is sort of a gentle version of the stranger-walks-into-town plot. Mildred is the personification of the “excellent woman”: capable, nice, practical, dependable, part of the background until someone needs a favor (cooking a piece of meat, instructing movers, organizing a jumble sale, writing notes to estranged husbands). 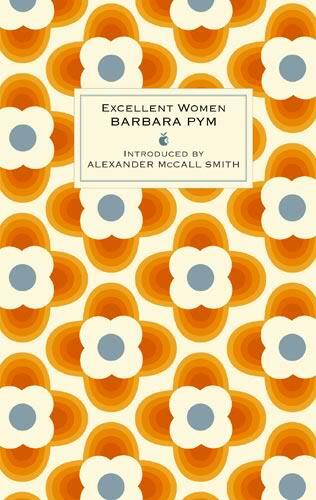 Pym is fantastic at kindly exposing the quirks of these excellent women as well as those who take advantage of them. I really loved Mildred, mostly because, against all odds, she’s not naive and has an acute understanding of her social standing. Together with her wit, this makes for a sarcastic and self-deprecatory internal commentary that’s great to read. She’s also (internally, at least) proud of her slightly drab and genteel independence. Ultimately, Mildred is someone I’d love to be friends with and someone I’d likely be if I’d been born 60 years earlier. I reflected a little sadly that this was only too true and hoped I did not appear too much that kind of person to others. Virtue is an excellent thing and we should all strive after it, but it can sometimes be a little depressing. Also, it is a truth universally known that an excellent women must be in want of a husband. Everyone assumes Mildred’s in love with every unmarried men in her vicinity, especially the vicar, and some of the funnier scenes happen when he gets engaged and Mildred is comforted as if she missed her final chance at married and a happy life. Reflecting back, the ending prevents Excellent Women from being a Happy Novel. It’s charming, no doubt, but in some ways sad. There is humor in Mildred, and fierce independence, but also fatalism. For a moment I though she’d have a happy ending with Everard because I let myself imagine that he really liked her (was the meeting at the church really just a coincidence?). I was ready to describe Excellent Women as a gentle love story. But then that final dinner happens, and Mildred doesn’t leave in a burst of righteous indignation. And I realize that Pym isn’t that sort of author. There will be no miraculous make-over, no over-heels-in-love knight in shinny armor, the austerity of daily life continues and her “excellent-womaness” persists. If they eventually get married (as a follow book of Pym suggests) Mildred will likely just become a married excellent woman. It’s one of the best books of the year so far, so if you like quiet stories with thoughtful, rich characterization, you won’t go wrong with this one.